As stupid as it sounds, I was actually looking forward to this flight just as much as my United Airlines Global First segment from SFO to PEK. 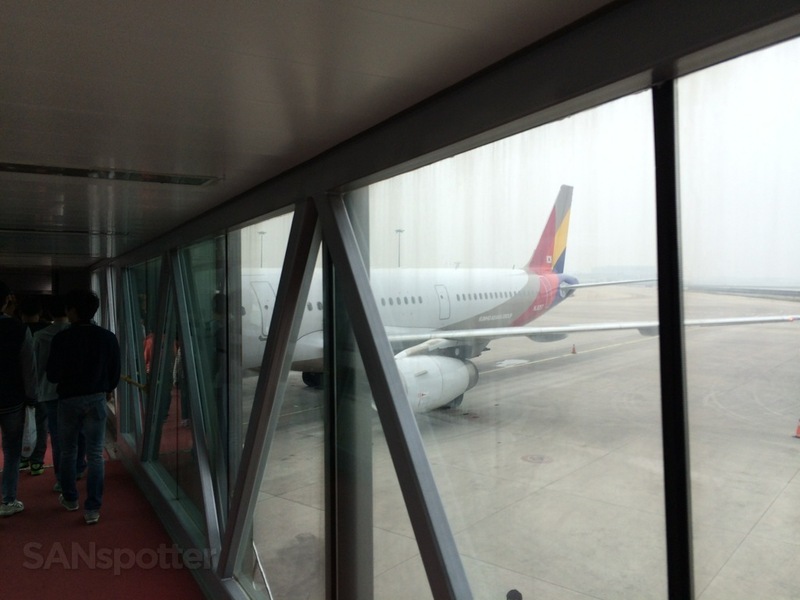 Yes, I knew full well that this PEK-ICN segment on Asiana Airlines was going to be on an Airbus A321, which meant that this would be their regional business class product and not thier premium long-haul product equipped on their wide body aircraft. 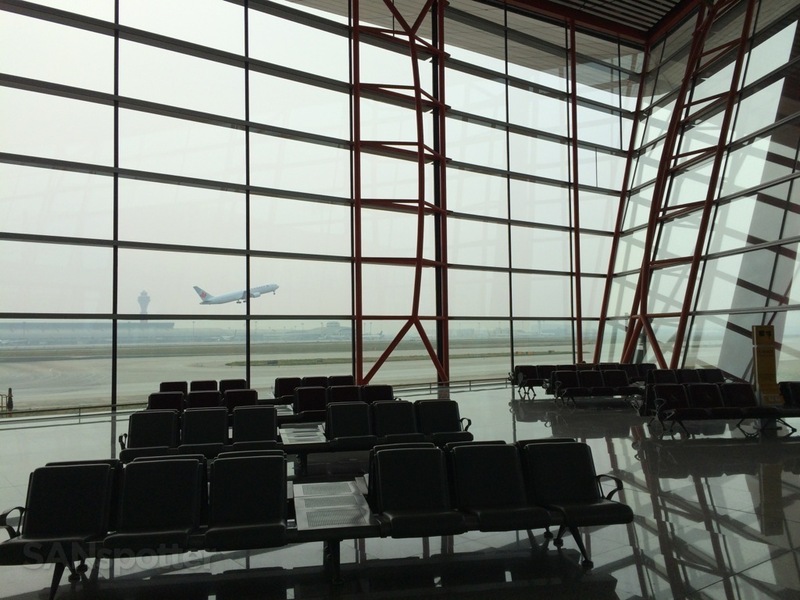 Still, I know that the Asian carriers put top priority on customer service, so I knew that I’d be pampered very well. 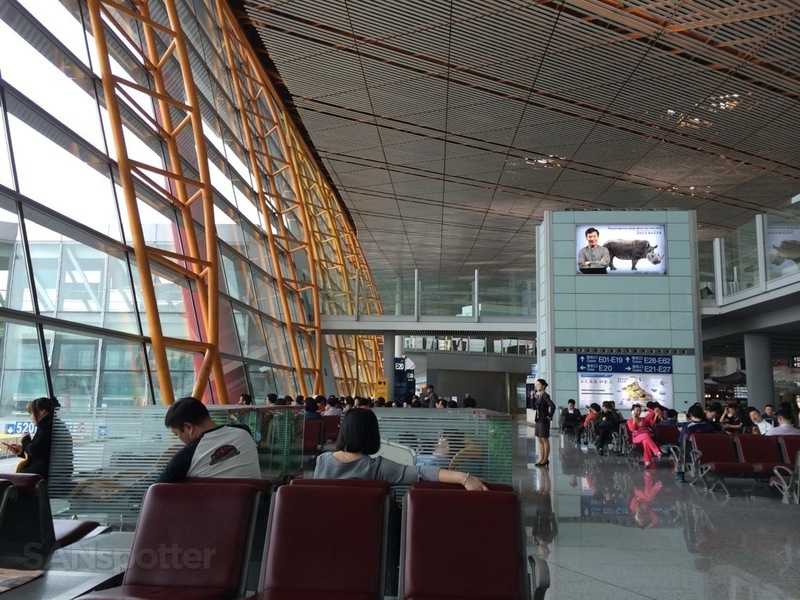 The flight was scheduled to depart out of gate E20, which was conveniently located adjacent to the Air China First Class lounge I had just come from. Boarding was called just a few minutes late, and the process was much different than the way it works in hey he US: it was basically a free-for-all in that they simply announced general boarding and everyone was free to board at the same time. 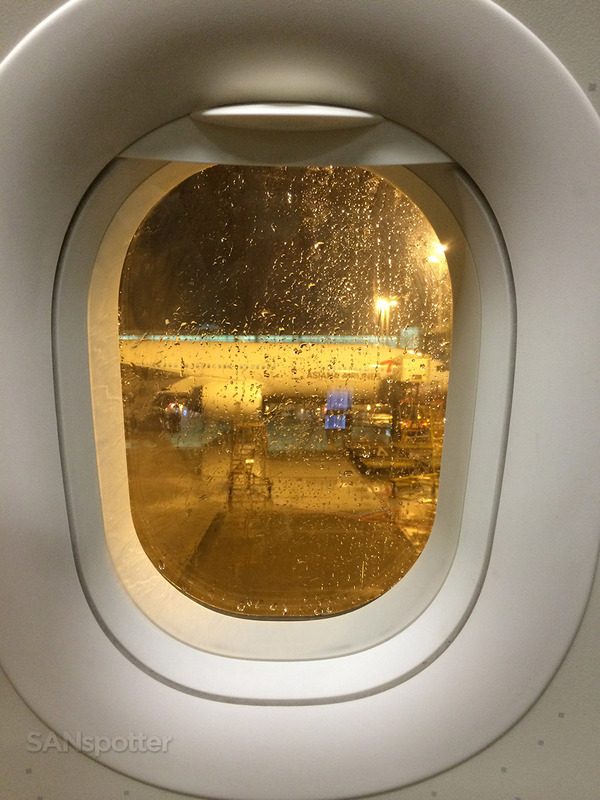 I was assigned to seat 1A, which was a system-generated assignment – I didn’t have any choice in the matter, but I preferred a window seat anyway so I didn’t make the effort to try and get it changed. 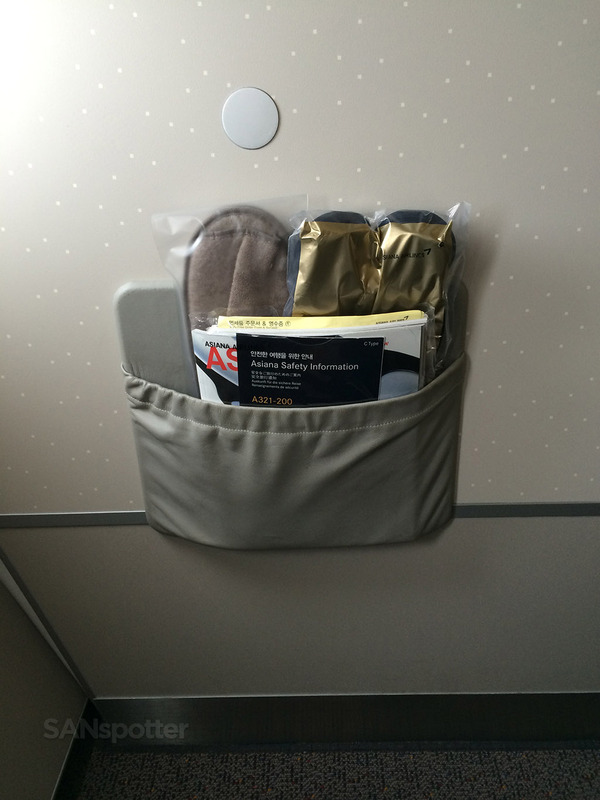 But the thought did cross my mind – I’m not a fan of bulkhead seats because of the lack of space to put any personal belongings. Oh well. 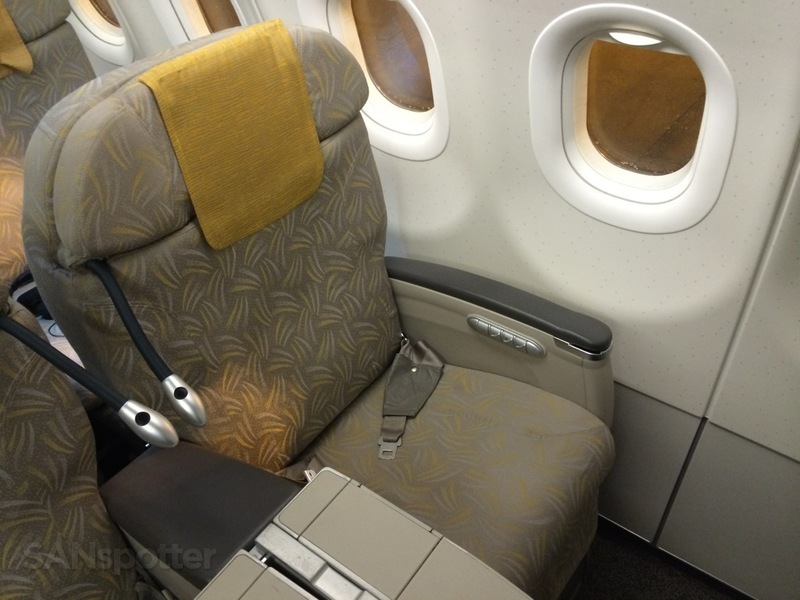 Once onboard, I found the seat to be quite comfortable. It was the same size as a typical first class seat on a domestic flight in the US, but the materials were of much higher quality at it felt really good. 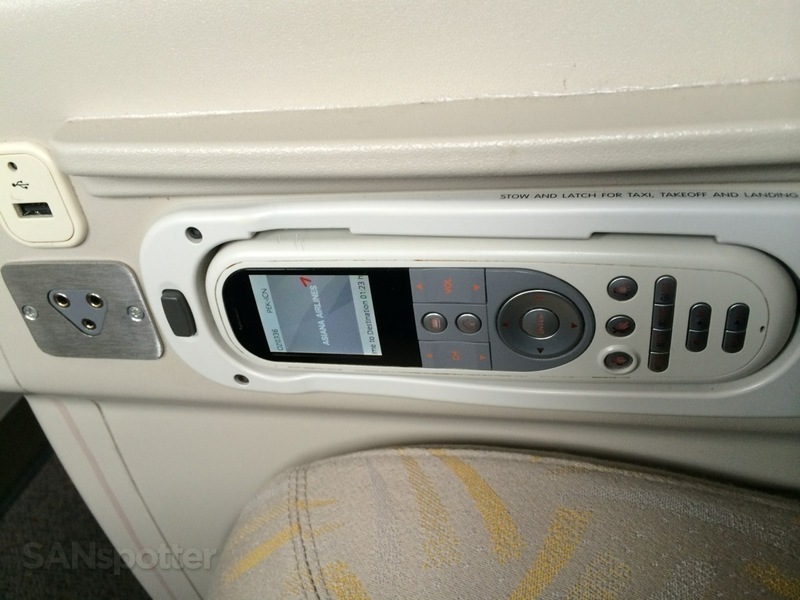 All controls for lighting and audio were in the armrests, and retractable video screens were located in the the center console between the seats. 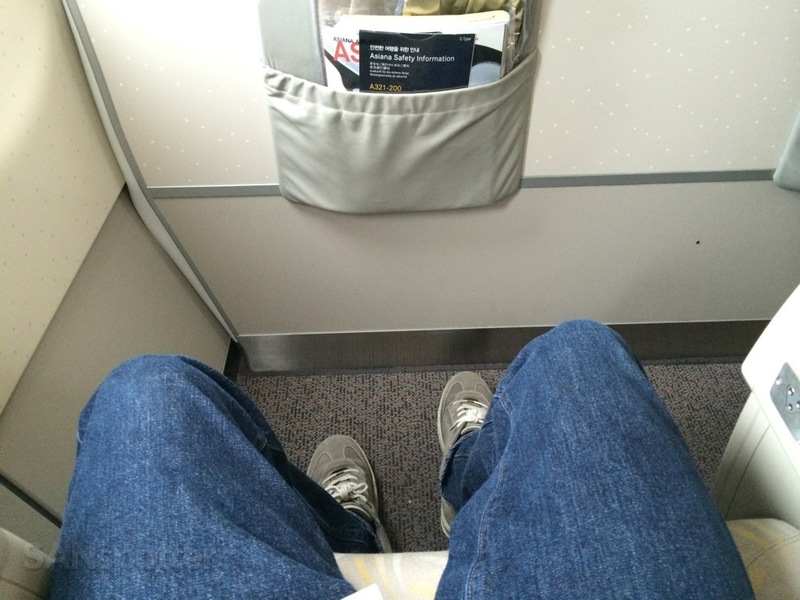 Leg room in the bulkhead row on the Asiana A321 is typical – nothing special here. The only issue up to this point was that my seatmate in 1A (an older gentleman who was obviously an airline employee) spent nearly the entire boarding process talking to the lead flight attendant and they seemed quite friendly towards one another. 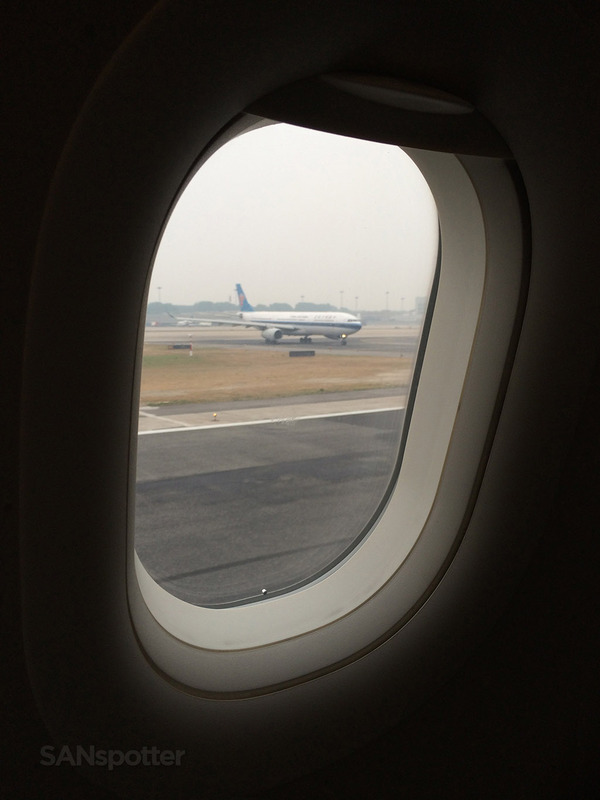 So yeah – I didn’t get much peace and quiet while we were sitting there at the gate waiting to push back. That same FA eventually made her rounds through the cabin introducing herself to each passenger. Her English was good, and she seemed a lot more enthusiastic about her job than the two elderly ladies who worked my United Global First flight from SFO. Once again – Asian service culture is tops! 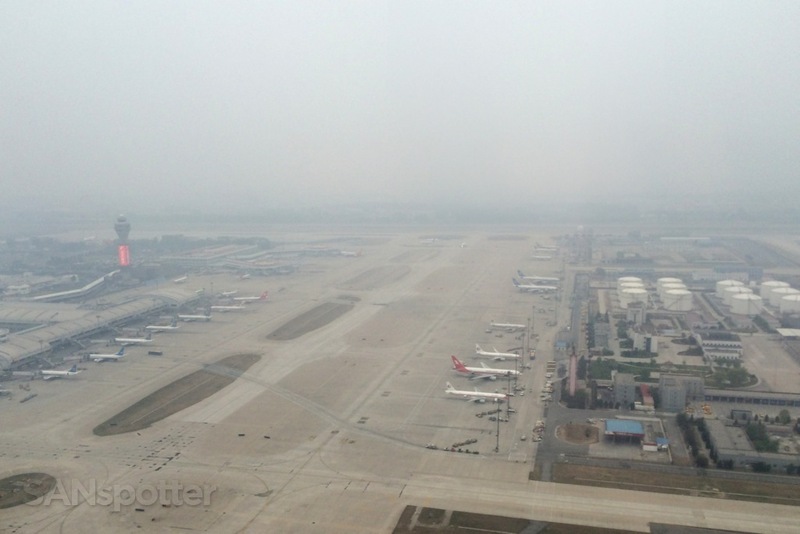 We departed runway 36L just a few minutes late and climbed into the hazy skies over eastern China. A few minutes later, the flight attendants came through the cabin with what were the hottest hot towels I have ever felt. They were too hot to hold – but only for a second. The steam was pouring off, and I swear I heard them sizzling! But it was exactly what I needed after a long day of flying so far. Menus were distributed and dinner orders taken. I chose the bibimbap, which was quite tasty even though I accidentally added too much spice to it. It was a bit too spicy, but still overall very delicious. I spent the remainder of the flight dozing on and off, looking forward to finally reaching Seoul and checking into my hotel for some much needed sleep. 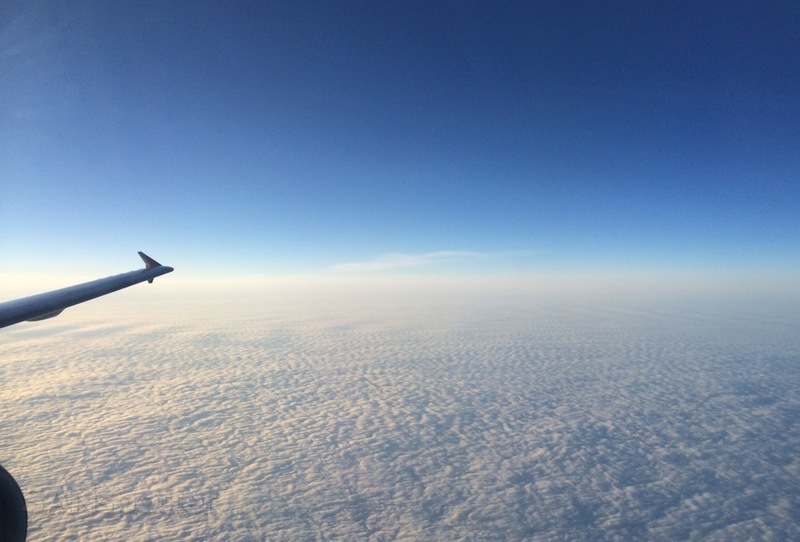 The lead flight attendant and the gentleman next to me started talking again, and I appreciate the fact that they moved to the forward galley to continue thier conversation after a few minutes – that appreciation and respect for the comfort of the other passengers was refreshing to see! It’s (unfortunately) the sort of thing you’d never see on a flight in th US. Different cultures, for sure. 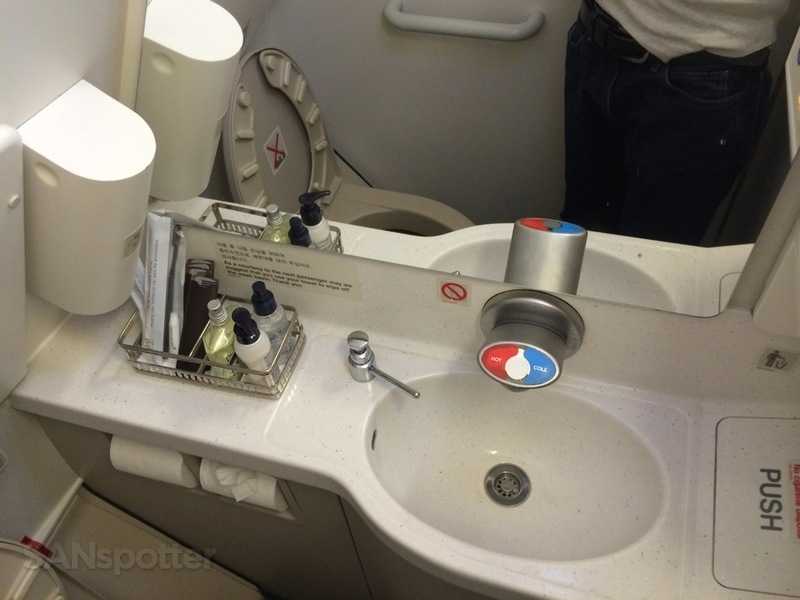 What good is a trip report without a picture of the lavatory? 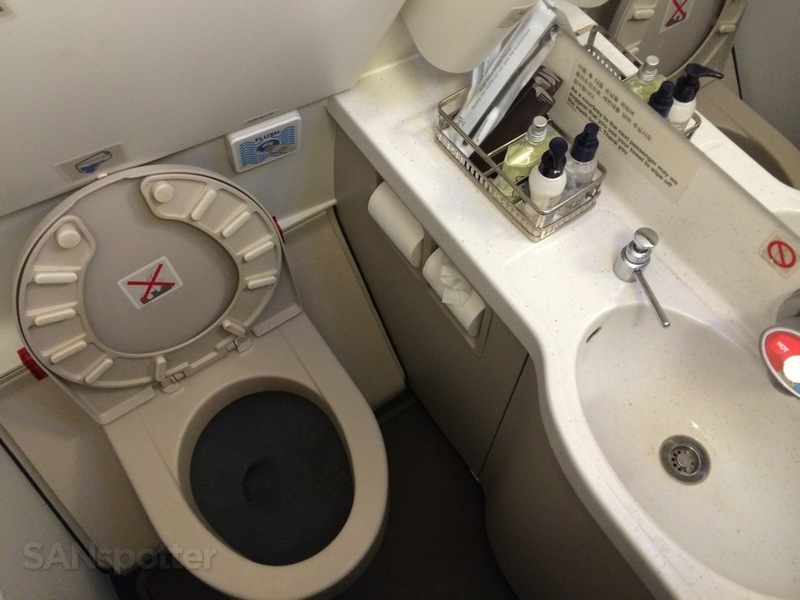 Just in case you wanted to see the Asiana A321 bathroom, here you go. The sun was setting as we made our approach, and we landed in light rain and parked at the gate shortly after 8pm. It was a long day, but I made it to Seoul! 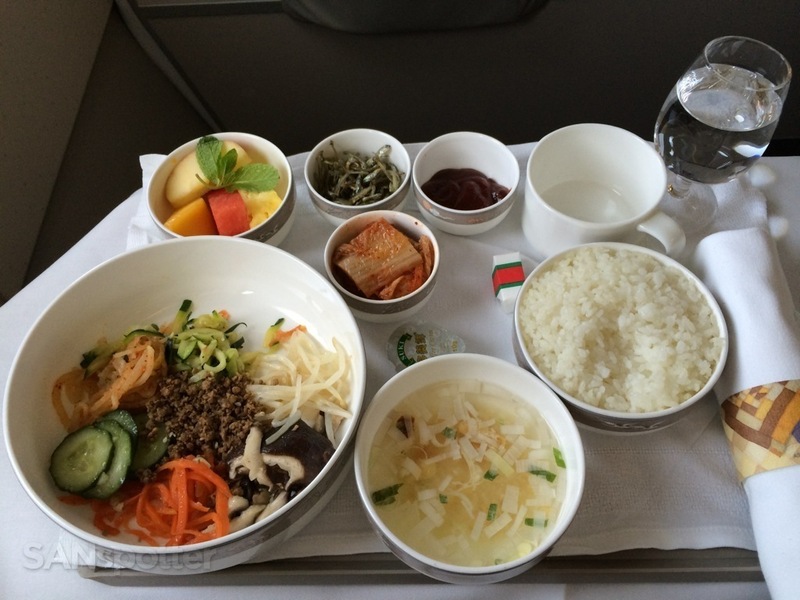 This was a very good flight, and a very good first impression of Asiana Airlines. 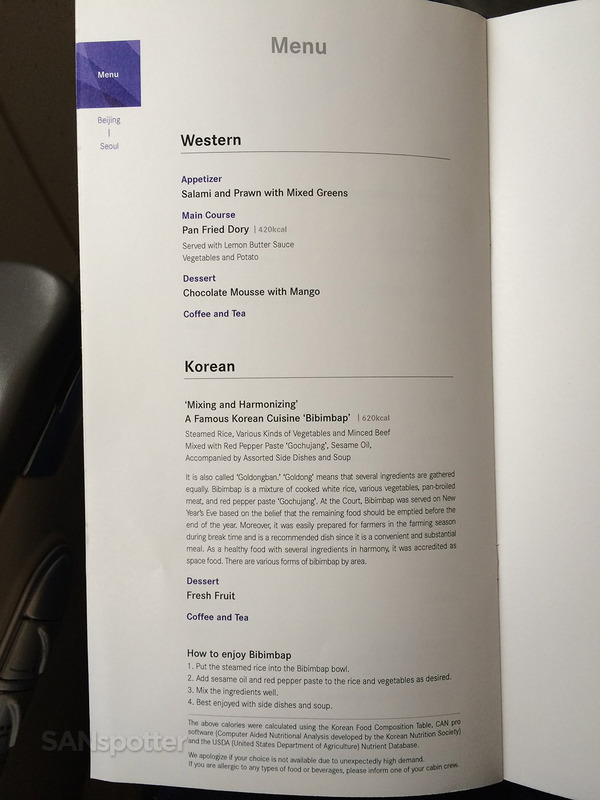 I’ve still got enough UA miles for one more business class award, so I’d very much like to try the Asiana long-haul product if I can squeeze it in.